5% Off First Orders at Harveys Furniture Store If its your first order at Harvey's Furniture Store, you can use this code and get a fab 5% off your order. 22% Off Orders at Harveys Furniture Store Revamp your home at Harveys Furniture Store, and save 22% with this voucher code. 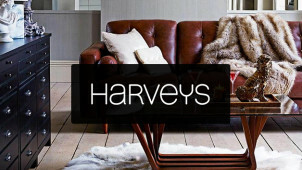 50% Off Selected Styles at Harveys Furniture Store Shop the sale at Harveys Furniture Store for up to 50% off styles. 20% Off 2 Or More Wall Art Orders Plus Extra 10% Off at Harveys Furniture Store Make your house a home with stunning wall art at Harveys Furniture Store. Get 20% off when you buy 2 or more, plus an extra 10% off today! Up to £600 Off Marble Dining Sets at Harveys Furniture Store Huge savings in the Harvey's Furniture Store sale, shop now for up to £600 off marble dining sets and more! Price Match Promise at Harveys Furniture Store Found the product you just brought cheaper somewhere else? Let Harveys Furniture Store know and they'll match the price plus £10. Discover New In Soft Home Furnishings from £29 at Harvey's Furniture Store Shop Harvey's Furniture Store for new in soft furnishings and add the finishing touches to make your house a home. At Harveys you can be sure to find those key pieces that will help bring the look of your home together seamlessly. With colourful and abundant furnishings which are made or upholstered in Britain - Harveys passion is in the quality, comfort and look of all their goods. Keeping customers happy in their homes for over 50 years - now you can discover a haven of beautifully crafted items too. Find it all for less with the low prices at Harveys. Now you can invest in brilliance, browsing the 4 core sofa collections and more. Discover At Home, Moda, Sofas By You and Bay Leather Republic - whatever your style and whatever your interior design desires - with Harveys you can make it happen. Why not custom build your own sofa with Sofas By You? With over 5000 possible combinations - you will be sure to find the perfect match to your personality and your home's. This is where you can get creative with everything from the design to the fabric and colour finish. It doesn't stop at sofas either with Harveys, find categories for other areas of the home like Living Room and Dining - this is where you can kit your home out where you need it the most, and start indulging in your lifestyle with those key pieces. Shop all types of tables, units and accessories - from coffee and console tables to mirrors and bookcases - now you can jazz up your home with Harveys. How do I use my Harveys discount code? Click ‘Apply’ and continue to complete your transaction. Sign up to the Harveys’ newsletter with your email address to get the latest discounts and news on new collections straight to your inbox. Does Harveys do Student Discount? There isn't a consistent Student Discount in place at Harveys, however, vouchercloud will keep you up to date with all the latest money-saving offers. When is the Harveys’ Furniture sale? Stay in the know about seasonal sales by signing up to the newsletter. Does Harveys offer free delivery? There are 3 standard delivery fees, starting at £15 for rugs, £25 for small items and £59 for larger ones. You can use the Store Finder online to locate a Harveys close to you. Harveys wants to make its goods are accessible and affordable for everyone so there is a range of finance options available to suit every budget and person's needs. Check online to see whether you are eligible to apply. The cost of delivery will depend on the type and size of product you order. You will also be given a reference number so that you can track your order online. You have 14 days from the delivery date of your goods in which you can request a refund. Email web-sales@harveys-furnishing.co.uk with your order number. For an exciting range of home furnishings - visit Harveys. As the experts in this field, here you will find state-of-the-art sofas, chairs, dining furniture and more. Make great savings today with a Harveys discount code from vouchercloud and you’ll be in for a treat. Shop for every room and find something to perfectly suit in style, comfort and design for less - now it’s easy to turn your house into a home. When you shop at Harveys, you won't find a better price elsewhere; and if you do, they'll match that price plus £10. So should you find the same product available at a competitor store in the UK within 7 days of your purchase, make a claim instore or over the phone and be safe in the knowledge that you've got the best price on your prized pieces. Do remember to check the Terms and Conditions. Where better to rest after a long day at the office? Yes, a good sofa is a must-have for the vouchercloud team, and we rely on Harveys to provide comfort, style and value for money throughout their collections. With a Harveys voucher code it's easy to save on modern, traditional or eclectic additions to your lounge. Now you can make the most of your space with Harveys - without breaking the bank.